The relationship between language, translation, and abstraction is at the foundation of my practice. Building an abstract painting language is one of the frameworks for questioning how language is constituted. Painting is not a means to an end but a medium through which I can freely consider how producing new images in the world can potentially operate and stimulate how we think about communicative structures. A Dark Inquiry (2) is a work from a larger exploration within the artists’practice that posits abstract painting as a site that exists between image and text; here specifically the artist considers how language is constituted through the painted image. 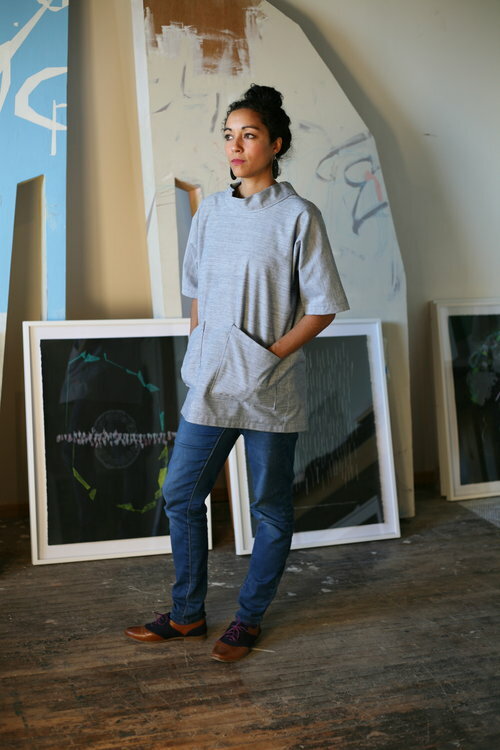 Caroline Kent is a Chicago-based visual artist who explores the relationship between language, translation, and abstraction through her enigmatic paintings and drawings. Kent’s marks and forms are driven by a process rooted in improvisation that then are choreographed onto the surfaces of her large-scale paintings. Kent speculates in both the potential and the limitations of language, and ultimately questions the modernist canon of abstraction. She has been exhibited nationally at the The Flag Art Foundation, the California African American Museum, The Suburban, Company Projects, and The Union for Contemporary Art. She is the recipient of awards from the Jerome Foundation, the Pollock Krasner Foundation, and the McKnight Foundation. Kent is co-founder of The Bindery Projects, an artist-run exhibition space founded in Saint Paul, MN. When current Editor-in-Chief Essence London joined the Indiana Review senior staff summer 2017, she launched the Sneak Peek feature. The idea is that subscribers have the chance to read a few pieces from the upcoming issue to get them excited about it; also, potential readers and anyone without the funds to buy an issue will have some access to the wonderful writing they're missing out on in print. If the work here interests you, please support the writers by sharing it on social media or support Indiana Review by purchasing a copy. 40.2 will be available by mid-December 2018.